A new smile for a new you. Restore your missing teeth and recapture your oral health. When you are missing all of your teeth on an arch, you may think a removable denture is your only option. However, thanks to the advancements in dental implant dentistry, you can achieve a more stable and fully-functional smile. With Nobel Biocare All-on-4® Implants you have found a permanent denture solution that can be fitted in just one day. In fact, you may have heard the nicknames ‘teeth in a day’ and ‘smile in a day’ – these refer to this innovative treatment. 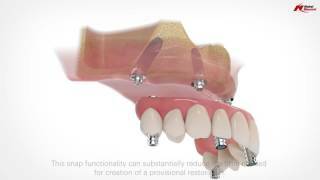 All-on-4® implants can be used for both the upper and lower jaw. Rather, than being inserted vertically, the rear implants are placed angled with the same stability. This opens the door for patients who have suffered jawbone deterioration and would normally need a bone graft. Eliminating complications such as this, allows Dr. Yu to restore your smile in less time. At SmileMore Dental, our Oro Valley dentist teams up with a local periodontist to restore smiles using All-on-4®. Dr. Graig Brown brings years of experience and advanced training to our office when performing implant dentistry. Why Choose All-on-4® by Dr. John Yu? Our Oro Valley dentist uses state-of-the-art technology to give you your smile back. Missing your smile can have a major impact on your life and your health. Dr. John Yu uses his advanced training and technology to restore the function of your bite and the natural look of your smile with All-on-4® Implants. He educates you on the pros and cons of this option and outlines the plan for this procedure, step-by-step. All-on-4® is a great option for those looking for a definite solution to missing teeth and can be completed in a single day. Find out how All-on-4® implants are placed. for those with missing teeth. Learn about this innovation procedure by watching the video below. Are you having trouble viewing this video? Watch it on YouTube. They have the absolute best technology and service in Tucson. Best dentist in Tucson by far! Offer includes a complimentary 3-D scan (available for new patients only). Find out if you are a candidate for All-on-4® or traditional dental implants. We are offering the opportunity to enjoy a complimentary consultation with our implants dentist, Dr. John Yu. *Images and x-rays are for SmileMore Dental use only and cannot be transferred to another practice. Eat your favorite foods and smile with confidence.